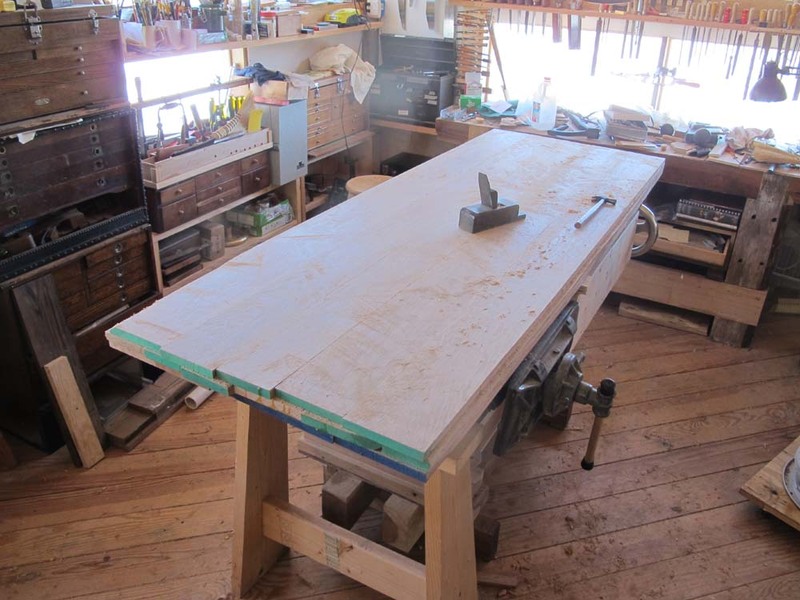 Among the flaming chainsaws I am juggling at the moment, by far the weightiest is my interpretive rendition of HO Studley’s workbench I am fabricating for the upcoming exhibit of the Studley Tool Chest and its companion workbench, now less than two months away. 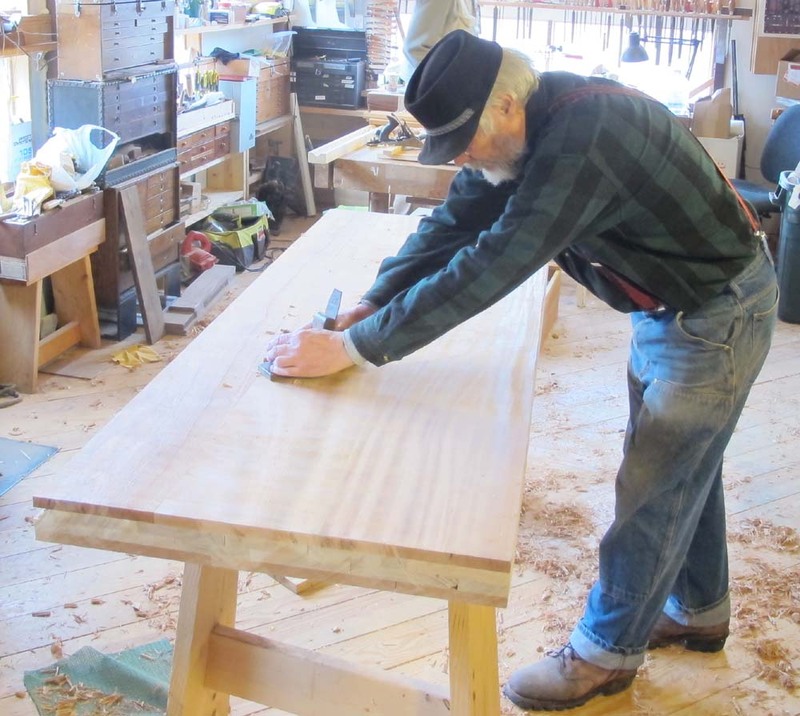 The purposes of this element of the exhibit are basically two-fold; to demonstrate the manner in which Studley built his bench top, and to have some place to hang the half-dozen piano-maker’s vises (which you will be allowed to play with). I realize that not everyone is as interested in these as am I. Heck, outside of Jameel Abraham, nobody is as interested in these as am I. Why do these vises capture my imagination so? Why is peanut butter and mayonnaise my favorite sandwich? Some things are just chalked up to the vagaries of the cosmos. 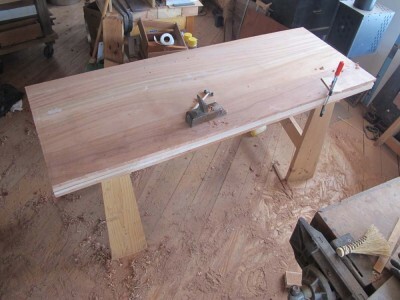 I’d blogged earlier about my frustrations with the African “Mahogany,” and in return heard from my friend Rob in Lawrence, Kansas, with encouragement. He had encountered the same problem, and instructed me on how to overcome it. I will write soon about my adaptation of his advise –use an ultra sharp high angle smoother and take infinitesimally light cuts — in an upcoming post, but for now all I was wanting was to get the slab workably flat. For that I continued working with my newly sharpened toothing plane, which was doing its job admirably. Still, the process was not without problems. 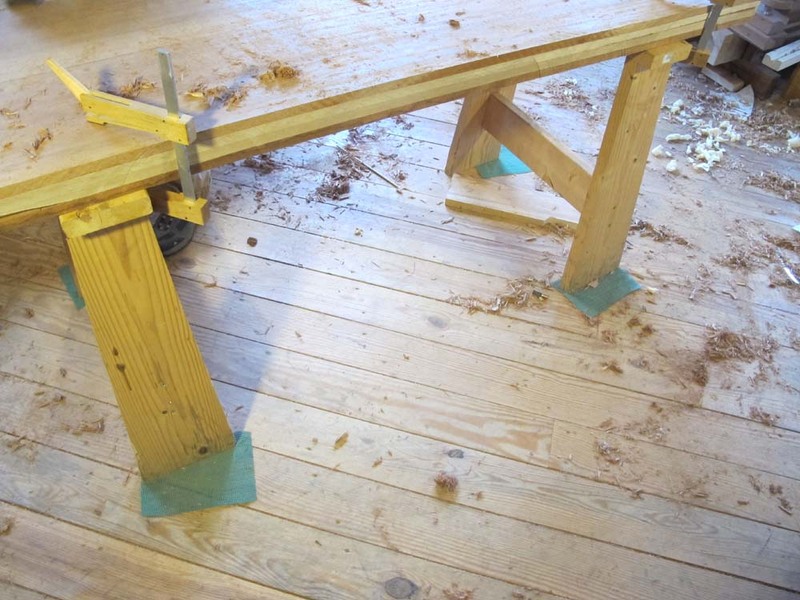 I had the slab clamped to the sawhorses in the corners and worked regionally. The issue at this point was the floor. 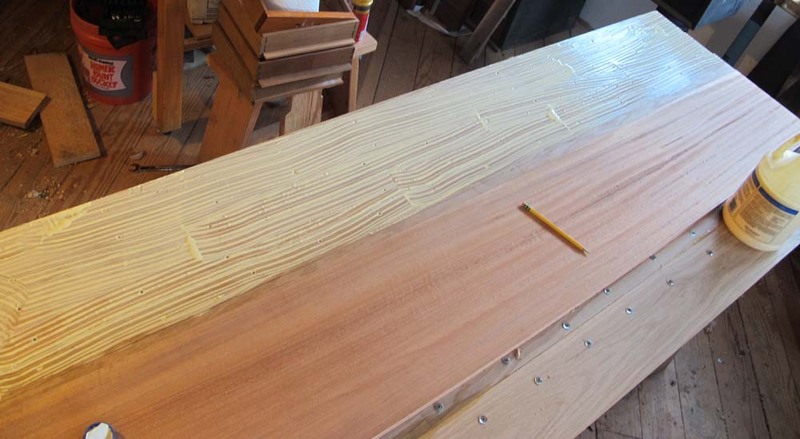 Yes, my southern yellow pine flooring has become “polished” through foot traffic, and at times the entire assembly of slab and sawhorses skidded across the floor. After extensive exasperation with this, I grabbed some of the open webbed non-skid padding I used under my sharpening stones, or when sanding on the bench or something like that, cut it up and tossed a piece under each foot of the sawhorses. 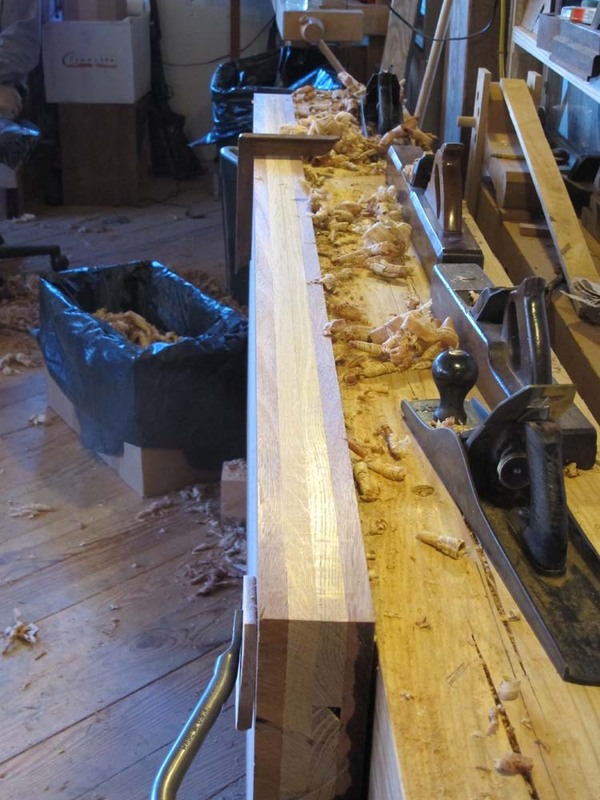 I then got the slab on edge clamped to my planing beam with a new pair of holdfasts from Tools For Working Wood (they are fabulous and I will order three or four more pairs) and worked the long edges, which will eventually receive the edging similar to Studley’s. The slab for the Studley work bench top is all glued up and trimmed to size, and slid off my workbench onto a pair of horses for further ministrations, and just in time as I need my bench space to finish up a large group of sample boards for a luncheon presentation I am making soon for an architectural/decorative arts finishes assembly. 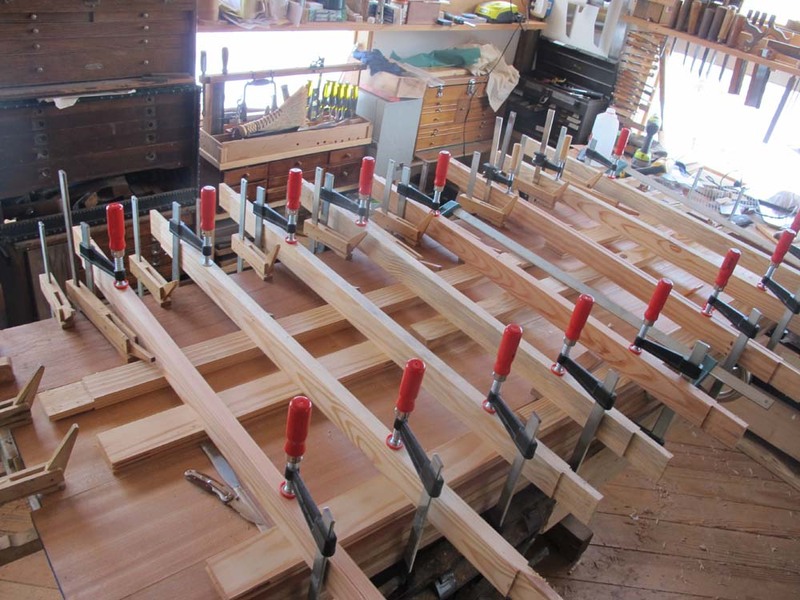 I have a lot of clamps, but not enough for me to affix the final top lamina of the bench in one step, so I first glued on the first half, then a day later the second half. The slab is a beast, and I would estimate its weight at about 175 pounds. 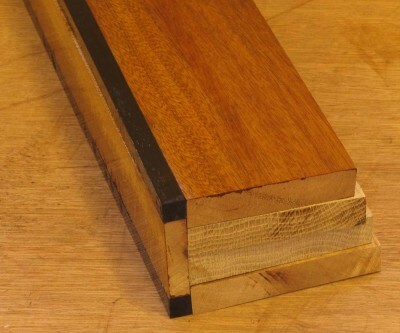 My version is about 1/8″ thicker than Studley’s, giving me a little bit of room for planing and finishing. 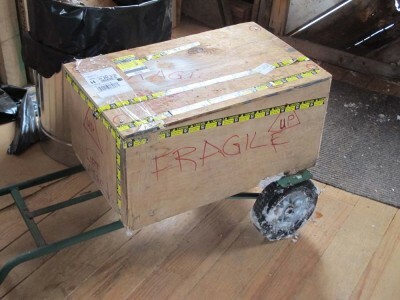 The edges will be installed once the wheel-handled vises are attached for the exhibit, which will turn the top into a 500-pound behemoth. Planing it is a challenge. I touched it with my “go to” low angle smoother and got horrific tear out. That took me back on my heels. Hmmm. So, I switched to my favorite toothing plane, and got tear out with the toothing plane as well! I mean, I have never had tear out with that toother. I backed off the blade a bit and had some success, and today I will touch up the toothing blade and proceed, but it will be slow even though the surface needs very little work. The next challenge is to resharpen my smoother to use after the toother, or conversely just tooth it overall and go straight to the scraper for the final surface. 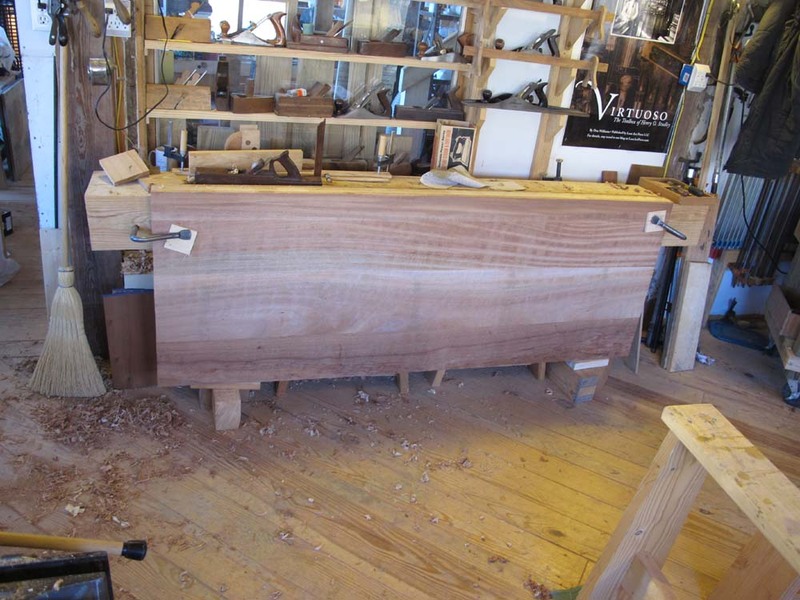 With three of the four lamina glued up for the replica Studley workbench top, I got the assemblage flipped over and moved onto my bench for planing the oak core surface for the final lamina, the top (African) mahogany boards. I must say that even now this hunk weighs a ton. I can barely flip it over by myself. 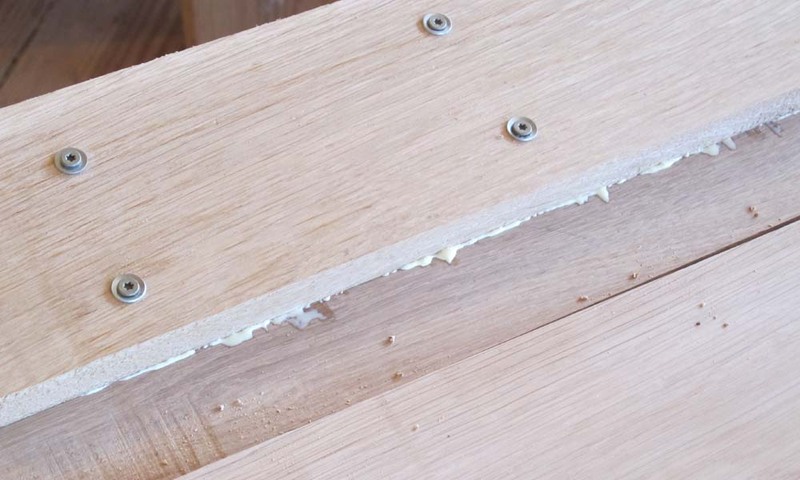 I like to use a toothing plane to work surfaces like this, and using my favorite toother I went after the surface this morning. 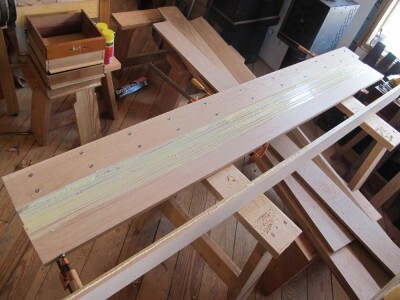 My care in the assembly to this point paid off as it took me only about an hour to get it ready for the final glue-up. Once the final lamina gets glued on, I will trim the unit to size, fit the vises to it, then work on the edges. I was bewildered, as I recalled that the web site selling the tickets indicated that the process was for the tickets to be distributed to the attendees at the exhibit itself, which in fact is the case. But I was wrong in thinking that information was on the web site; it must have been in our earlier blog announcements. I am sorry for the confusion. We are not sending you a ticket when you purchase one, but rather you go into our list as someone who purchased it and will be given the physical ticket at the exhibit. Simply come at your appointed time, get your ticket, and go in to the exhibit hall and spend the requisite hour ogling this masterpiece. We will add a passage to the web site reiterating that, but be assured that if you bought a ticket and received confirmation of purchasing the ticket, we know about it. For anyone who does not know, the exhibit of the tool cabinet, its contents AND Henry Studley’s workbench, will be coincident with Handworks 2014, and only 20 minutes away from HW’s Amana, Iowa location, in the beautiful Scottish Rite Temple in downtown Cedar Rapids, Iowa (the next town away) from May 15-17, 2015. 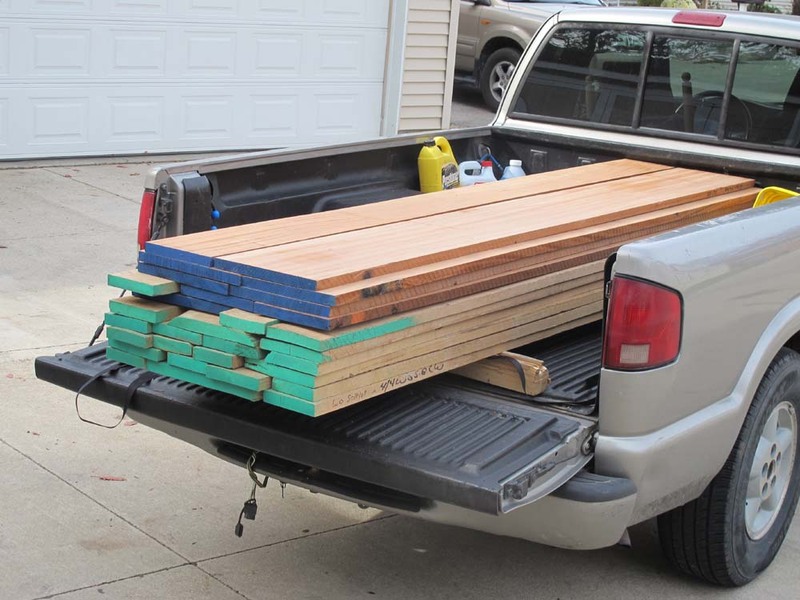 The time had come for me to render the truck load of lumber into the replica of Studley’s workbench top. For the base I am going to construct a (hopefully) mostly invisible stand for the exhibit, since I simply do not have the time to replicate the base that is part of the bench currently. The first things I noticed when preparing the stock were 1) the white oak from Iowa is some of the hardest material I have ever seen. 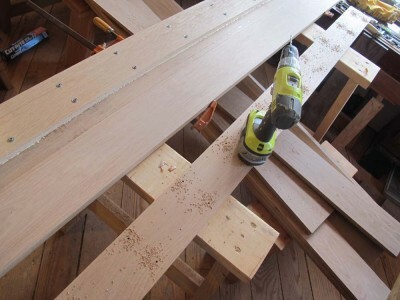 Even taking only 1/64″ cuts with my DeWalt planer, it was just about killing that machine. It is almost a shame to bury such magnificent lumber inside the core of a laminate slab, but that’s what I get for replicating the unit as precisely as I can determine. I should note that this construction is based on my many hours of examining the original; the owner would not let me cut up the original to confirm my premise. 2) by working character, density, and odor, I found the “African Mahogany” to be nearly identical to Spanish Cedar, and were it not for the interlocked ribbon grain I would have sworn that was what the lumber was. 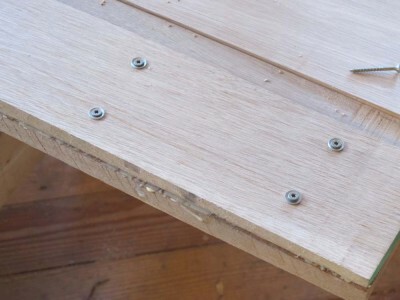 In assembling the slab I reverted to an old gluing technique from the pattern shop, where we often glued complex constructs together by clamping the pieces with nails or screws, then removing these fasteners when the glue had set. Not having enough clamps of the correct size, and not wanting to build a press to accomplish the task, I did the same this time. It didn’t really matter for the core or the underside of the slab, but gluing the top lamina was a bit more of a challenge as you will see in a coming post. Using my planing beam I first cleaned up the edges of the oak core boards and started to glue them together with yellow glue. 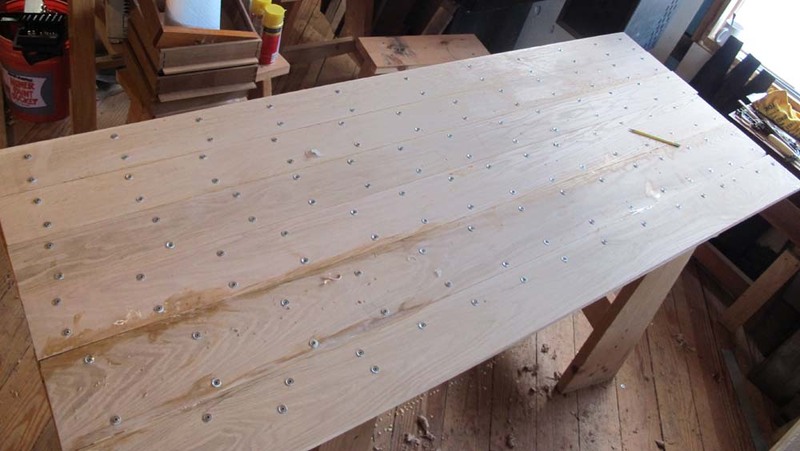 First I pre-drilled holes the size of the screw threads about six inches apart throughout the entire length of the boards, then screwed them together with deck screws and washers, The efficacy of the tactic was apparent with the fairly even glue squeeze-out. I made sure to make the boards off-set to add even more strength to the completed structure. Once the two core lamina were assembled, the structure was exceedingly strong and heavy. Almost immediately I began with the underside face of the slab. Repeating the same steps as before, after removing the screw-clamps I glued and screwed the African Mahogany boards in place, shooting the edges by hand first. It was long past dark when I headed down the hill for supper, but the first three of the four 3/4 inch layers were in place. Already it weighs a ton. Thursday was a banner day in the Highlands as the first test pages for Virtuoso: The Tool Cabinet and Workbench of Henry O. Studley appeared in my email. It is an indescribable feeling to see the seemingly endless labors being expressed with such visual elegance. I look forward immensely to the coming days in anticipation of seeing Wesley Tanner’s magic bringing my words and our images to life. Especially if he continues to show my best side! I am truly thankful to those of you who have offered encouragement over the past four years on this project, and expect your patience will be richly rewarded in only a few short weeks. Increasingly I am turning my focus to crossing the “T”s and dotting the “I”s for the upcoming exhibit of both the tool cabinet AND the workbench, which has never before been seen in public. 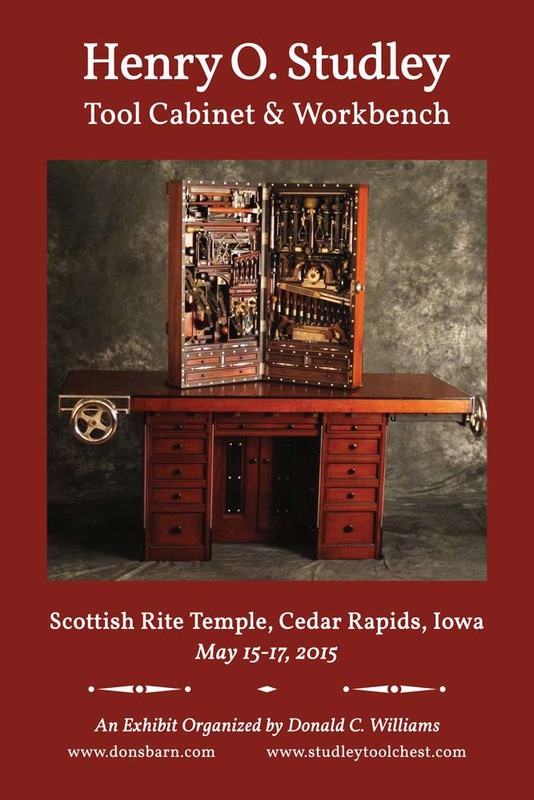 Given the concurrence with and proximity to Handworks, perhaps the greatest celebration of contemporary woodworking tool making ever, it will make for an unforgettable weekend. The setting for this collection of vises is my interpretation of Studley’s work bench top. I expect to finish assembling the slab of that top tomorrow. Here’s a small mock-up illustrating what I believe to be the construction of the bench top. Astonishingly, the owner of the Studley Collection would not let me chop up the original to see if my conclusion was correct! Once the benchtop replica is finished I need to make an exhibit stand for it, then move on to the next of the 6, 487, 326 things on the exhibit check list. There are still tickets left for the exhibit, but I see that some of the sections are beginning to close out. If you want to join me in this once-in-a-lifetime event, I would be delighted to share it with you and chat with you at the exhibit. 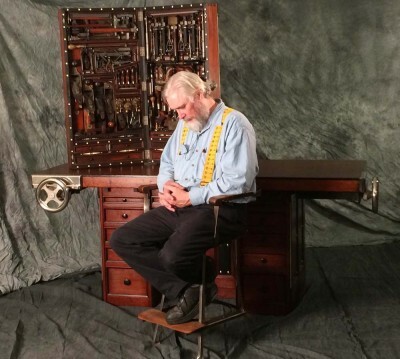 One of the common questions I get regarding the upcoming exhibit of the Studley Tool Cabinet and Workbench is, “Will you take the tools out of the cabinet so I can see everything inside?” The answer to that is “No.” A second question is, “Do we get to handle the tools ourselves?” Apparently the folks who ask this question have never been to museums or artifact exhibits. This is not to say that the visitor experience will be to view a static and lifeless exhibit. I’ll be making sure the exhibit is a rich and rewarding experience through a couple of avenues, one of which I address here. One of the final tasks for the recently completed work session with the Studley tool Cabinet was to film a real-time session of me removing the entire collection of tools from the tool cabinet, one at a time. 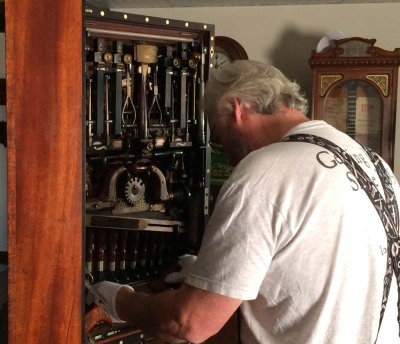 In doing this the video reveals every single tool in its place, and how that relates to the adjacent tools and the cabinet as a whole. This video will be running on a loop on a giant screen at the end of the exhibit hall at the Scottish Rite Temple in Cedar Rapids. 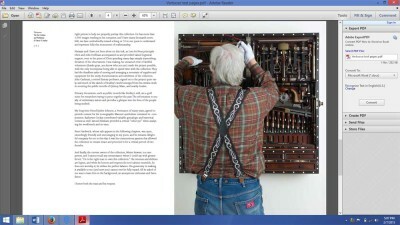 You can find more information and purchase tickets for the exhibit here.